For the safety and security of your residential or commercial swimming pool, a fence surrounding your pool is an essential part of your pool area design. You need a strong, durable fence that is safe and secure. It should also complement the beauty and design of your swimming pool and decking. 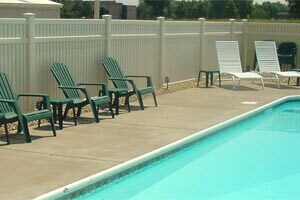 As a leading national discount fence supplier, we recommend Bufftech vinyl fencing to many of our customers who ask about swimming pool fencing. Variety of design and color, along with the strength and maintenance-free qualities of Bufftech vinyl fences, make them ideal for this use. If you are looking for affordable vinyl fencing materials, we have the largest selection of styles, colors and textures. PVC fences are easy to install and every shipment of panels, posts, pickets and gates comes with step-by-step DIY installation instructions. Our experts are standing by to help you select the components you need and guide you in fence installation. Contemporary Picket Fence Designs – Baron, Princeton, Monarch, and Countess Bufftech styles include features that make them compatible with most local fence codes. Semi-Privacy Fence Designs – Imperial style fences from Bufftech make an ideal, code-approved, semi-privacy fence around your swimming pool. Privacy Fence Designs – When a privacy fence is your choice to surround your pool, Bufftech recommends the pool code compatible Chesterfield style. Matching aluminum-framed gates for all of the above recommended Bufftech fence styles make entry and exits easy for you, your family and guests. Self-closing hinges and key-lockable gate latches increase the security of your pool area, and are highly recommended. Again, check with your local jurisdiction for requirements in your area for swimming pool fences before making your choices. 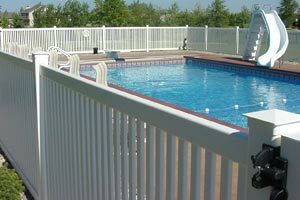 You can count on our nationwide fencing supply company to provide you with the exact Bufftech PVC vinyl fence for your swimming pool or any other fencing need. Our seasoned staff can assist you in choosing the right Bufftech vinyl fence, along with accessories that match your city’s code requirements. We’ll help you create a customized materials list that includes all the panels, posts, pickets, boards and gates. We will give you a price quote, based on your exact dimensions or sketch, and answer all of your questions. Your materials will be shipped quickly to your location, complete with installation instructions and post location measurements. Call us today to get started on any fencing project, and we’ll show you why we’re the nation’s leading source of direct-shipped fencing materials.